One of the things that I didn’t realise before I started working at TWE was quite how slow boats are. We’ve been waiting for quite a while for our latest shipment of whisky to arrive from Japan, with a couple of express shipped cases serving only to tease both us and visitors to this year’s Whisky Show. However, the wait is now over and we are very pleased to announce the release of our newest TWE exclusive – The Spirit of Asama. It’s a whisky distilled at Karuizawa, increasingly the source of some of the most sought after Japanese whiskies. 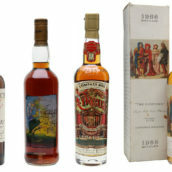 This is in part due to the fairly impressive quality of the single cask bottlings that have been hitting the market over the last few years, but also because of the sad lack of distilling that has been going on at the distillery for over a decade. Despite a variety of negotiations from interested parties looking to restart the distillery, the owners returned their distilling license earlier this year and the site will now almost certainly never go into production again. 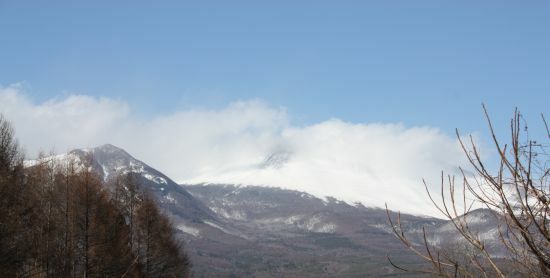 Fortunately, the folks at Number One Drinks, who have been bringing Karuizawa into Europe over the last few years, managed to buy up all the remaining casks from the distillery in August 2011 and since then have been planning something a little bit different to their regular releases – the aforementioned Spirit of Asama. 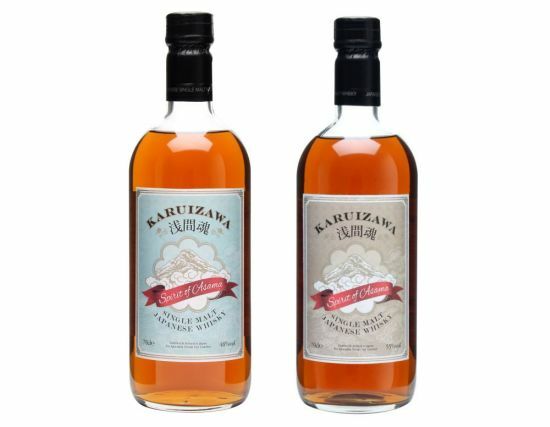 Every release of Karuizawa we’ve seen in the UK in recent times (if not ever) has been a single cask bottling, and the small outturns and corresponding high prices have meant that not all that many people have had the chance to try whisky from this rather special distillery. 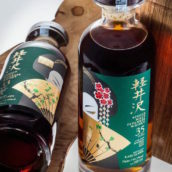 To remedy this, Number One Drinks selected 77 casks containing spirit distilled in 1999 and 2000, the last couple of years of production at the distillery, and vatted them together to create the largest batch of Karuizawa seen in quite a while. The plan for this whisky is simple – have enough of it that it won’t disappear from the shelf in the blink of an eye, making it possible for more people to try Karuizawa before it all runs out. Rather than bottling all of the whisky themselves, Number One Drinks also asked a select group of whisky distributors if they’d like to do something interesting with the spirit and we jumped on the chance to make the release our own. After much experimentation (hic! 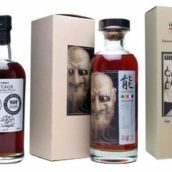 ), we decided that one bottling wasn’t good enough – we wanted two versions of Spirit of Asama, one bottled at 48% and one at 55%. We settled on these strengths to show different sides to the Karuizawa character – both the rich and elegant sherry of the lower proof and the more volcanic and explosive flavours of the higher. Nose: Brown sugar, fruit cake, dried and glacé cherries, hints of sweet port, polished leather, rich earth and hints of damp forest floor. Palate: Rich leather, sweet raisins and dark chocolate to start, but sour fruit builds up to balance the sweetness, with tannic apple skins, tea and damp, smoky wood. Finish: Hints of wood smoke, new leather jackets and damp bark. Comments: Rich sherry sweetness balanced by earthiness and a little bit of charred wood. Still intensely flavoured despite its lower strength than many Karuizawas, and showing off the rancio edge so often found in the single casks. Nose: Nutty and a little sappy at first, then a mossy earthiness, new leather, a grapey raisin character and a very faint hint of truffles. Develops very nice notes of brownies and chocolate fudge cake after a couple of minutes in the glass. Palate: The grapey note is the main player initially, then some firm oak, chopped brazil nuts, pepper and clove spices and finally getting grapey again as the earthy notes appear. This is not the kind of sweet sherry one gets with an Aberlour, for example – it’s a drier sherry character. Lovely, slightly drying, mouthfeel makes it moreish. Finish: Good length, becoming dry and more oak-tinged without any bitter notes creeping in. Comments: A relatively gentle Karuizawa when compared to some of its merciless older siblings, but with plenty going on nonetheless. 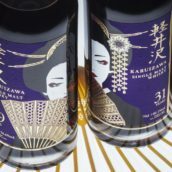 Very interesting to try the Karuizawa sherry style at this age, with the interplay of sweet, dry and savoury giving impressive depth for its comparative youth. Nose: Slightly closed, old polished wood, dried mixed fruit, moist tobacco, dry oloroso richness. A drop of water exposes more sweet fruit. Palate: Rich and sweet, hints of black liquorice, eccles cake insides, old driftwood, muddy forest floors, herbal with green leafy edges. Finish: Lingering savoury green leafiness, some tobacco and wet wood. Comments: More intense with a deep earthiness and some great vegetal notes. It’s also quite adaptable with a drop of water, changing to bring out more of the sweeter flavours of the 48% version as you dilute. Nose: The same elements as the 48% version, but with more noticeable sweetness now and a bigger emphasis on the raisins. Big notes of polished oak. Gets earthier with time in the glass, with autumn leaves and faint notes of very dark chocolate. Even a cursory nosing reveals this to be a much more serious beast. After about 15 mins, the nose transmogrifies into something really special, with old medium-sweet sherry, ancient varnished benches, Black Forest gateau and a hint of balsamic vinegar. Palate: Pretty big and hot at full strength. Sweet and grapey / raisiny, then a very powerful oaky spice wave, then sweeter hints again, with the dark chocolate and hints of rich treacle – faintly resembles a cask strength navy rum in places. Finally the earthy, leafy, mossy character comes to the fore. Finish: Warm, savoury, dry and very long. Comments: Despite the age, this is a Karuizawa that has to be taken seriously. It’s pretty amazing to get such a clear view of the distillery character without the thunderous sherry influence (glorious as it is) that so dominates the majority of the ‘normal’ single cask releases. To add water would be to defeat the purpose of the dual bottling, so I didn’t. The Spirit of Asamas are now on sale for the incredibly reasonable prices of £54.95 for the 48% and £61.95 for 55% release, and, quite differently to every other Karuizawa release we’ve seen, we hope to keep it in stock for a little longer than the nanosecond the single casks last for.